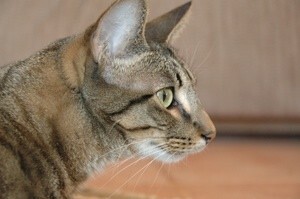 Tweega is a 2 year old Hybrid Herringbone Tabby. I found Tweega injured as a kitten near the vet's office. He likes to jump in the air and catch his favorite toy mouse. He can jump 4 or five feet! He is sweetest cat ever but rarely purrs.